It's getting to be the time of year when our thoughts turn to Christmas. Each year we feature a theme that brings the holiday to mind, such as Christmas trees, angels, and simple stylish holiday quilts. This year we're focusing on figures of the season, starting with Matryoshka (Russian nesting dolls). These adorable dolls are popping up everywhere: we've seen them in soft toys, ornaments, table runners, pillows, clothing, quilts and more. 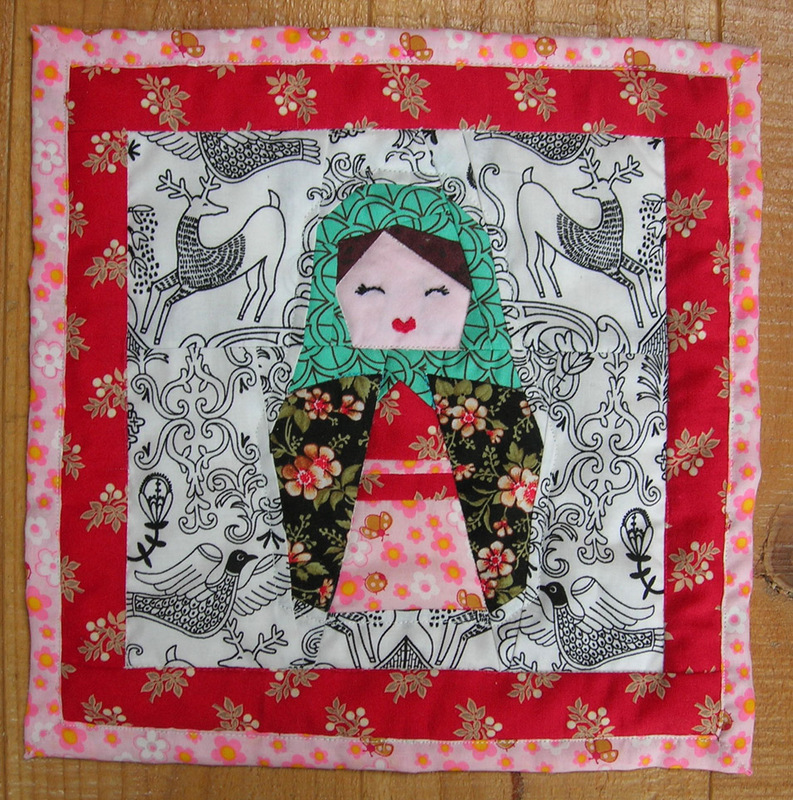 In this post we've assembled some fabulous Matryoshka Quilt Inspiration. 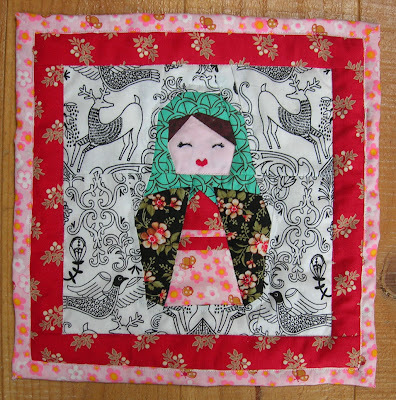 Cyrille Zellweger has created a charming paper-pieced Matryoshka pattern named "Olga" that can be used for a folk style quilt or sewing project. You can use your fabric scraps and dress up your dolls as you wish (we love her fabric choices). The Bubblestitch pattern includes clearly labeled paper piecing pattern sections, a color chart and instructions, along with a size chart to reduce or enlarge the pattern from 8" to 6", 10" or 12". You can make a set of dolls in different sizes ! 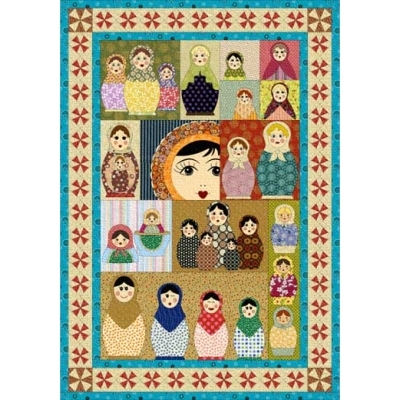 View and purchase this and other stylish Bubblestitch patterns, including a Dutch doll named Anneke, at Etsy. 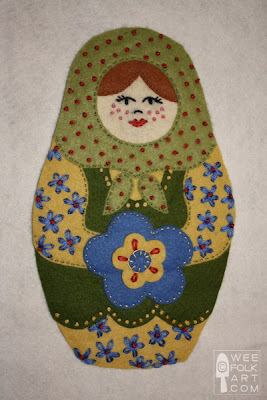 Kimara at Wee Folk Art designed this lovely Matryoshka applique, which is made with felt and decorated with embroidery. The doll measures 9" but you can enlarge or reduce her to meet your needs (see the directions). Kimara used 6 strands of floss, making lazy daisy flowers and French knots in the center of the flowers and as the dots on the doll. As you may know, the busy mother/daughter team of Kimara and Michelle are the creators of Wee Folk Art; you can find many fun projects at their site, including their famous gnomes. 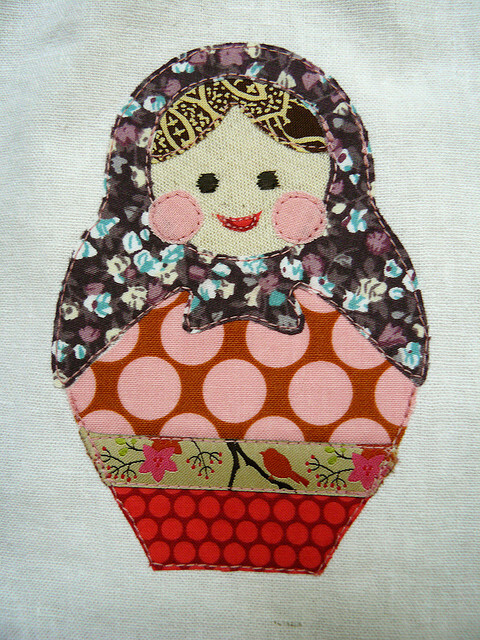 Astrid Thusgaard created a sweet Matryoshka appliqued blouse for her daughter Frida. The trim on the blouse matches the fabric in the doll's scarf; for details and more photos see this blog post. In fact, Astrid makes the most adorable clothes for children; for inspiration, see her photostream at Flickr. She uses many patterns from Ottobre Design (Finland), a magazine specializing in mod children's and youth fashion; it is distributed worldwide in 5 languages including English. You can download the Matryoshka pattern and 20 other cute designs at this Ottobre Designs project page. From high up in the Andes mountains, in the city of Quito, Ecuador, Angie Padilla and her family run her international business: Angie's Quilt Pattern Shop. Her highly original designs are rich in applique work, such as this delightful Matryoshkas quilt. Here are dolls of all sizes and manners of dress, along with the lifelike face of a doll with her long eyelashes, black hair and floral headdress. It would be fun to dress up these dolls with interesting prints! 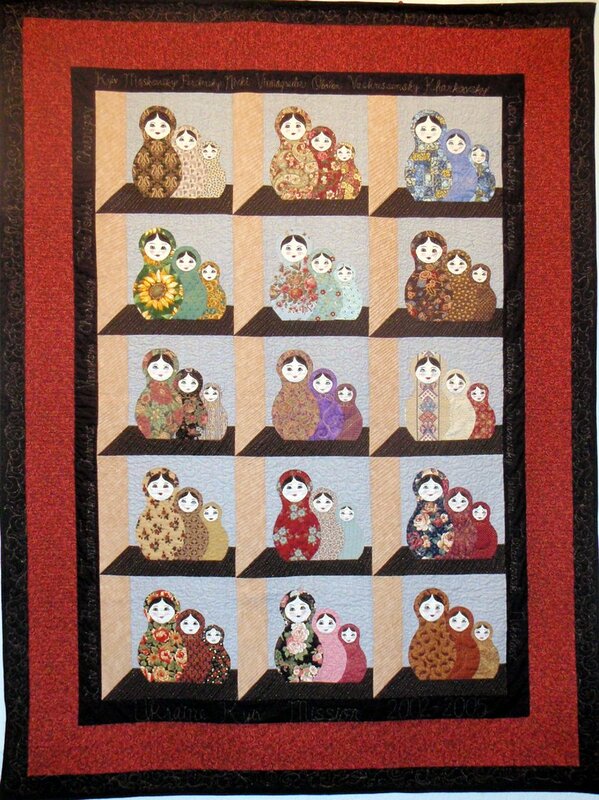 You can see a finished quilt by Marianne Wieberdink (Netherlands) at Angie's Flickr Pool. Abby’s Reflection is located across the street from the St. Michael’s Russian Orthodox Church in picturesque downtown Sitka, Alaska. 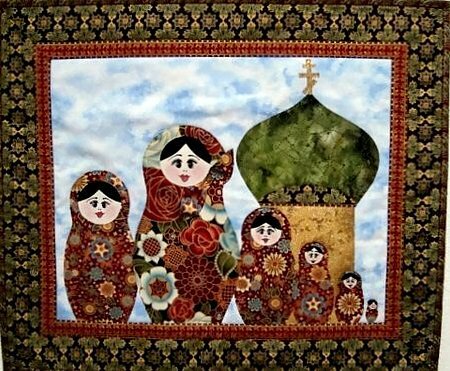 In honor of the town's Russian heritage, this quilted wallhanging features a row of Matryoshka dolls in front of a cathedral onion dome. 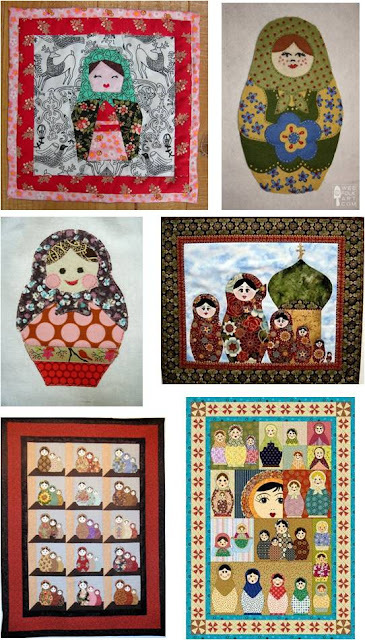 The Russian Doll quilt kit is made up in fabrics as you see here, including a lovely ethnic looking fabric for the dolls. Abby’s is the premiere shop in Alaska for Alaska-themed fabrics, patterns and kits, including some fascinating salmon quilt patterns and Tlingit designs. Deborah Raymond took the photo of this quilt at the 2009 Springville, Utah quilt show; you can see this and other beautiful quilt photos at her Quilt Show in Springville post. In addition to quilt inspiration, Deborah's Wonder Woman Creations blog is chock full of sewing and craft tutorials, cake decorating and other inspiring projects. This particular quilt brings to mind a Russian dolls quilt on exhibit at the Ukrainian Cultural Center in Alberta, Canada. The attic windows quilt block is a great way to display objects like these Matryoshka dolls. 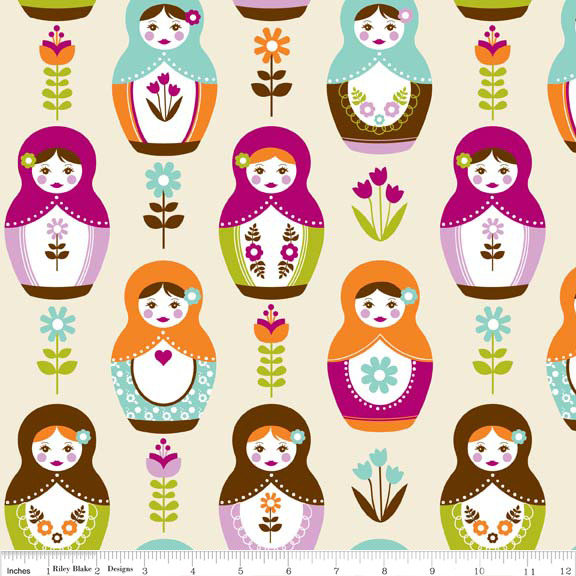 Riley Blake Designs has announced the Little Matryoshka fabric collection by Carly Griffith, coming to stores in January 2013. 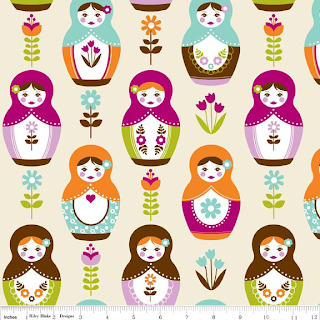 The matryoshka prints will be in three colorways and there are some wonderful coordinating prints. Image credits: Quilt images are shown with the generous permission of Cyrille Zellweger at Bubblestitch Quilts, Kimara at Wee Folk Art, Astrid Thusgaard at Connecting the Dots, Jill Scheidt at Abby's Reflection, Deborah Raymond at Wonder Woman Creations, and Angie Padilla at Angie's Quilt Pattern Shop. What a lovely collection of Matryoshka dolls. Love having our little applique included in the group :) Thanks!